I am new here and looking to confirm a ww2 flag I purchased as a 1st Canadian Corps Command Headquarters flag. The flag is marked with the c broad arrow. Any other markings on the flag? Bill wrote: Any other markings on the flag? Great looking flag! I think I remember that one for sale. Yes I got it off Ebay! mk1rceme wrote: Great looking flag! I think I remember that one for sale. I suspect that the flag is Naval, not Army. edstorey wrote: I suspect that the flag is Naval, not Army. I was thinking Atlantic Command just last night. I thought it might be naval as well with the center tie on the bunting. I also read somewhere that the Canadian Navy painted green maple leafs on the ship's funnels in ww2. Great looking flag regardless of unit origin. So, I hear this flag was a proposal for a new Canadian flag back in the late 40's. I never would have guessed that. Given the evidence, it is not likely the flag was a prototype design. Two reasons. First the colours are reversed, and second why would a prototype Canadian flag have a military acceptance mark? Who knows...I've seen that stamp on a few things that made me do a double take. Just looks way too close regardless of the color placement. I did see some COTC patches that resembled this flag as well...without the leaf of course. Correction....not COTC, Royal Military College. My bad. Bill wrote: Given the evidence, it is not likely the flag was a prototype design. Two reasons. First the colours are reversed, and second why would a prototype Canadian flag have a military acceptance mark? I totally agree, It is not the 1947 proposed national flag. I had seen that before but, had ruled it out. 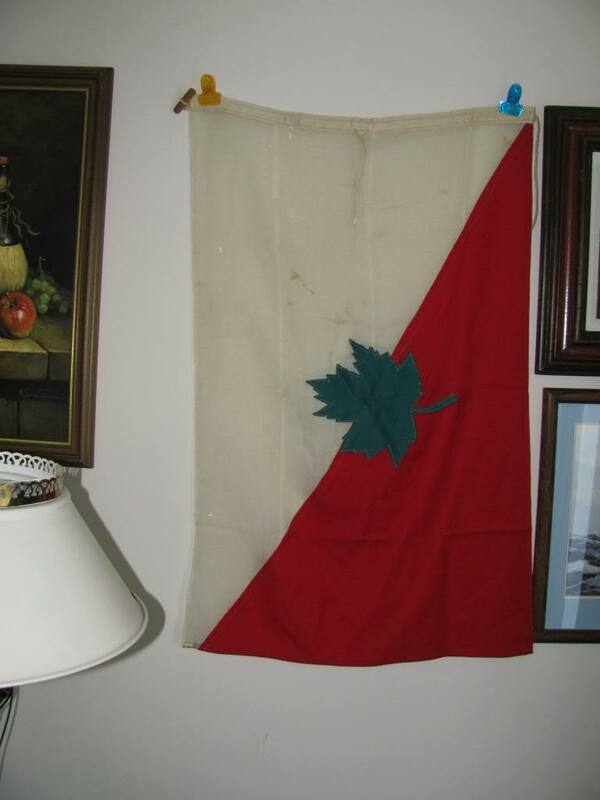 This flag came from a collector in Nova Scotia. I came up with an idea and have no proof what so ever. I read that Canadian warships painted green maple leafs on the ships funnels so the ships could be identified as Canadian and not British. I propose this could be a flag used by the Canadian merchant navy to identify Canadian ships from British ships. Just a thought. 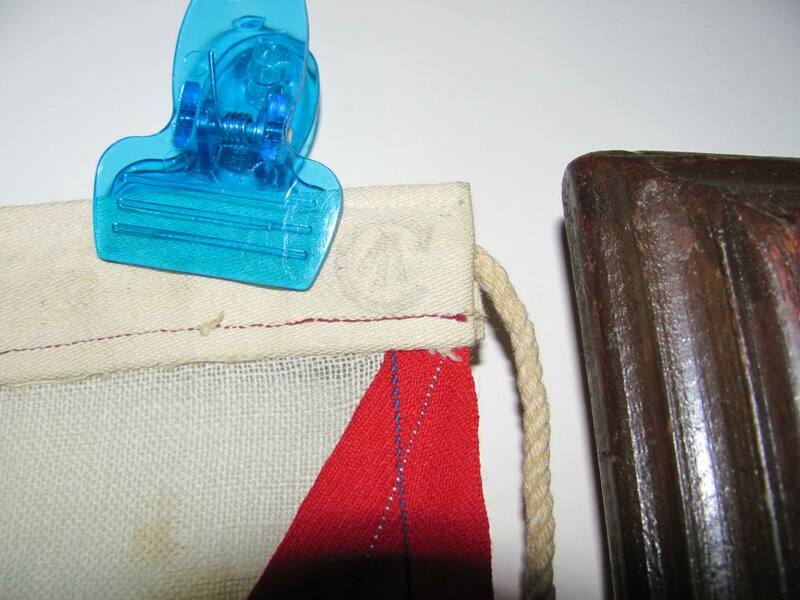 The flag could also be a post-WWII item as the 'C Broad Arrow' did not stop being used until the early 1950s. edstorey wrote: The flag could also be a post-WWII item as the 'C Broad Arrow' did not stop being used until the early 1950s. The flag does not glow under a black light.